In an unusual play that involved a Penguin, a Bull and Vince Coleman establishing a major-league rookie record, the Cardinals stole four bases on one pitch in a game against their archrivals, the Cubs. On Aug. 1, 1985, at Wrigley Field in Chicago, Cardinals speedsters Coleman and Willie McGee turned a double-steal attempt into a successful quadruple steal. In the first inning, Coleman was on second base and McGee on first with none out and Tommy Herr at-bat, facing Scott Sanderson. Coleman had entered the game with 72 steals, tying him with Juan Samuel of the 1984 Phillies for the big-league single-season record for a rookie. On a pitch to Herr, Coleman and McGee took off for third and second. Catcher Jody Davis threw to third baseman Ron “Penguin” Cey in a futile attempt to nab Coleman. Coleman slid across the bag, “way deep in foul territory, almost in back of the coach’s box,” Cubs manager Jim Frey said to the Daily Herald of Arlington Heights, Ill. Slow to react, Cey didn’t rush to tag Coleman. “He would have been a dead duck had there not been a brain-dead Penguin on the scene,” wrote Mike Lucas, covering the game for the Madison (Wis.) Capital Times. Seeking an escape route, Coleman got up and scampered down the third-base line, with Cey in pursuit. “When Ron went after him … he ran out of the base line,” Frey complained of Coleman. Knowing he had no chance to catch Coleman, Cey tossed the ball to Davis. Coleman applied the brakes and headed back toward Cey. Davis ran toward Coleman, then lobbed the ball to Cey. When Coleman looked back, he saw Davis near him and no Cubs player protecting the plate. Sanderson had gone over to cover third. First baseman Leon “Bull” Durham, the former Cardinal, should have covered the plate but instead stood frozen along the first-base line, watching the rundown. Coleman whirled around, slipped past Davis and sped toward the plate. Cey, clutching the ball, gave chase. Coleman crossed the dish and McGee dashed uncontested from second base to third. The official scorer credited each with two stolen bases on the play. In so doing, Coleman had 74 steals for the season, breaking the rookie record. 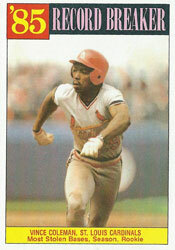 Coleman achieved 110 stolen bases in 1985 and was named winner of the NL Rookie of the Year Award. He also topped more than 100 steals in 1986 (107) and 1987 (109) and led the NL in stolen bases for six consecutive years (1985-90) with the Cardinals. McGee contributed a career-high 56 steals in 1985 and was selected winner of the NL Most Valuable Player Award, batting a league-high .353 with 216 hits in 152 games. The 1985 Cardinals, managed by Whitey Herzog, had 314 steals. No other team in the major leagues that season had more than 182.